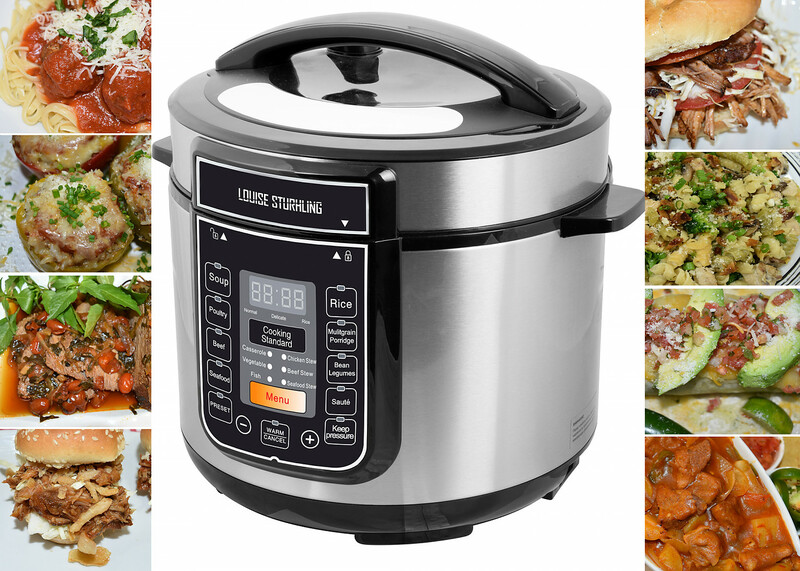 INTELLIGENT 10-in-1 MULTI-FUNCTION COOKER POWERED BY JAPANESE ELECTRONICS: Meet the Sleek and Powerful LOUISE STURHLING Intelligent Pressure Cooker powered by trusted advanced Japanese electronics. Replaces 10 kitchen appliances: Pressure Cooker, Slow Cooker, Rice/multi-grain Cooker, Saute/Browning, Yogurt Maker (Recipe on Website), Hot Pot/Soup Maker, Steamer, Food Warmer, Stew maker, & Cake maker. 14 PRE-PROGRAMMED EASY-TOUCH COOK SETTINGS: Easily cook Vegetables, Chicken Stew, Beef Stew, Seafood Stew, Casserole, Rice, Multi-grain, Porridge, Bean/Chili, Saute, Soup/Broth, Fish, Beef, Poultry & Keep Warm HIGH-QUALITY MATERIALS FDA & ETL CERTIFIED WITH 7 BUILT-IN ADVANCED SAFETY FEATURES: Enjoy the peace of mind knowing that your cooker is FDA & ETL Certified and has 7 Advanced Safety features built-in to ensure SAFE and EFFICIENT usage. 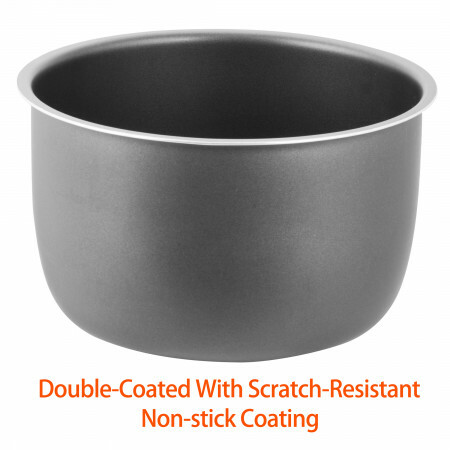 Features best materials including Very Durable High-Grade Stainless-Steel Body and a Durable Double Coated Cooking Pot. FASTER COOK TIMES & 24-HR DELAYED PROGRAMMED COOKING: Faster Cook times = More Energy Savings!!! Highly Energy Efficient. Cooks up to 80% faster than conventional slow-cooker while using 40 - 50% less energy. Slow Cook Results at Faster times!!! Plus, use the PRESET Menu Feature to Program to Cook at Later Time for up to 24-hr delay. BEST WARRANTY PLUS THREE EXCLUSIVE BONUS ITEMS: Enjoy Our Industry Best 30-day Returns and 12-Month Warranty. Plus, Exclusive Bonus Accessory item: Our Latest edition Pressure Cooker Cookbook!!! My Instant pot broke down after 2 years of use. I have become accustomed to cooking in my pressure cooker, but I wanted something more user-friendly because my oldest son always complained about the difficulty in using our old previous cooker. A friend of mine recommended this Louise Sturhling programmable cooker and I am glad I bought it. 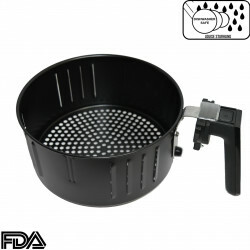 It is easy to use and my son uses it regularly now for cooking his black eye peas that he loves. This cooker cooks faster as well. 30 minutes and beans are completely cooked. Amazing! I LOVE MY NEW PRESSURE COOKER! 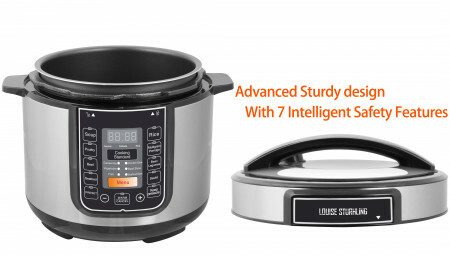 It is the fastest cooker I have ever used, and it is super easy to use because of the cleaner layout of the control buttons on the front panel. My son uses it regularly now and he is planning on getting one for his college dorm room. This machine is fast and can give you a 6-hour slow cooker results in 45 minutes or even less time. According to the specifications of this machine, it also uses about 40  50% less energy as well. This is important to us because of the high cost of electricity nowadays. Nice pressure cooker! 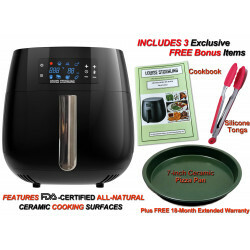 This cooker is loaded with features compared to our older pot and has over 14 preset menus to cook soups, stews, even pound cakes and much more. We are trying new meals everyday because of the wide-ranging preset menus. And one of the best features of all, in my opinion, is the 24-hr delayed program that allows you to program the cooker to start cooking at a later time so that you have freshly cooked meals ready as you walk through the door after work. I have not tried this delayed cooking program yet, but I think it is a great idea and will be using it soon. The high tech 7-layered safety features also give me the peace of mind that I am cooking with a very safe machine. 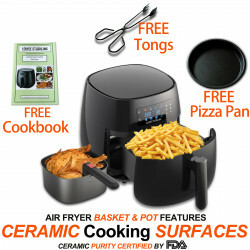 I highly recommend this cooker. Buy it and you will not regret it!!!!! Never going back to the 6-hour slow cooker days. Now I slow cook in one hour. Made a pooled pork dinner in as little as 2 hours. This cooker is a dream come true for me. I love it. My family loves rice and we eat it almost every week. My rice cooker broke after 5 years and I did not want another rice cooker that only cooks rice. I found this cooker on google and I love it. You can cook rice, cook beans, make soups, stews and the list goes on and on.... I call it my super cooker now. The cookbook is also very helpful, and I am about to try slow cooking a pork shoulder in it this weekend. There is nothing like it. Please but it and you will not regret! I purchase 2 more for my Mom and sister. Great cooker! First shipment got lost and had to wait another 4 days to receive it. I like the way customer service responded and re-send the product to replace the missing one. But overall, I did not like the shipping experience. Buy this one and you will not regret it. 10-in-1 and essentially replaces 10 appliances in the kitchen. Unbelievably great! Had a mishap with my cooker the first week I received it. I accidentally damaged the steam venting knob as I was trying to clean the lid. 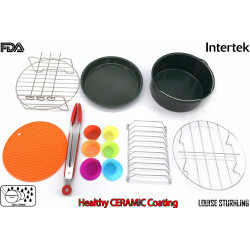 I contacted Louise Sturhling customer service hoping to buy a replacement lid since it was my fault. To my surprise the associate by the name Bella, processed and shipped me a completely new cooker. You guys are amazing. I am enjoying the cooker now almost everyday cooking my favorite Vietnamese soups in 10 minutes. Great cooker and top-notch customer service. THANK YOU Bella! Love my programmable pressure cooker. Easy to use and easy clean. I love the stewing program. I made crab vegetable stew last night in 20 minutes in total. Highly recommend. Awesome cooker. So easy to use. It has with tons of programs that makes it easy to use. Love it. Cannot wait for the larger model for my large family. Too big for my counter space. Had to return it.